I got tipped off about this, and I thought this is something I should write about. Currently until the end of the day today, April 25th, you can vote for the top dog in the American Humane Hero Dog Awards. This yearly award ceremony will be done in Beverly Hills, California, and will air on the Hallmark Channel later this fall. Here is how this contest will work out. You have until 2 pm Central on April 25th to vote! 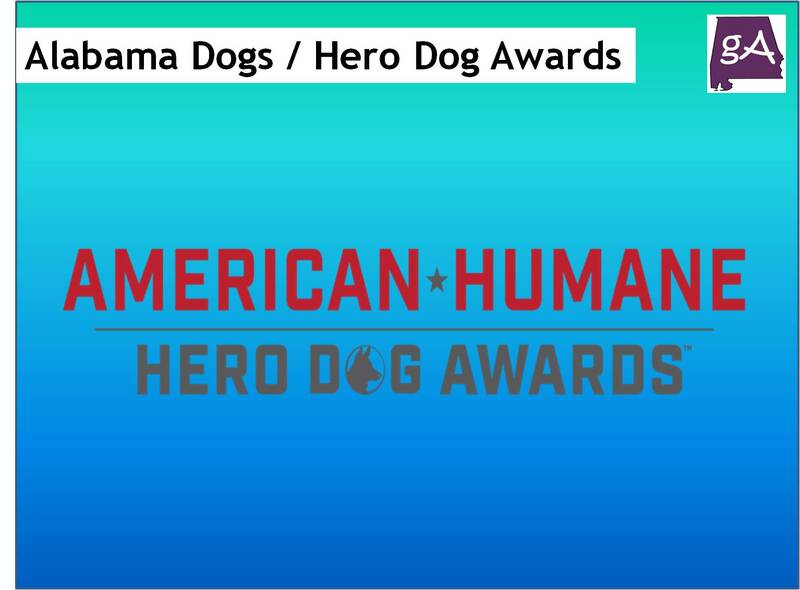 Welcome to the American Humane Hero Dog Awards®, the annual campaign that recognizes heroes on both ends of the leash. Seven lucky finalists and their human companions will be flown to Hollywood for a star-studded awards gala, which will be broadcast nationwide on Hallmark Channel next fall. Of all the courageous canines, one dog will be awarded the grand prize American Hero Dog title. In order to cultivate the next generation of hero dogs, American Humane will donate $2,500 to each of the seven finalist’s charity partners, and the American Hero Dog will win an additional $5,000 for their charity partner! Here in Alabama, the local animal assisted therapy group called Hand In Paw has three dogs running in the contest. It would be really cool if one of these three dogs named Jeanie, Desi, and Rocky could win this whole thing! Below is a description of each dog and a link to vote for them! Once homeless & crippled, this three-legged dog went from rescue to certified therapy dog. Jeanie works for a Children’s Advocacy Center where she comforts children who are questioned by forensic investigators in physical and sexual abuse cases, violent crimes, and even homicides. She and her owner volunteer at hospitals, schools, nursing homes, reading programs (where the photo was taken) and veterans’ homes, where Jeanie bonds with fellow amputees. Jeanie was rescued in south Louisiana when she was five months old & was adopted after a deformed front leg was removed by a local vet. Jeanie spent a day with traumatized elementary students who witnessed a shooting in their classroom. She helped an apprehensive child speak to officers after witnessing a murder/suicide. In both cases (and others), she provided a diversion from the horrors of those events. She attends counseling w/amputees, attends children’s grief therapy, comforts students during finals week, & visits schools’ special ed classes. A veterans’ home resident w/dementia, who had been crying for two weeks, was calm & content, even joyful, during a visit w/Jeanie. A video of the pair went viral on social media. 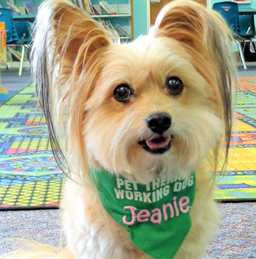 Jeanie deserves to be the American Hero Dog because she truly makes a difference by giving love, hope and comfort to those who need it most, especially frightened and traumatized children. We hope to inspire other counseling, advocacy & law enforcement agencies to consider the benefits of therapy dogs. This is a legacy of two corgis. In the picture I sent when looking at the picture Roxie is on the left and Desi is on the right. Sadly we lost Roxie on 11-1-17 to a brain tumor. Desi is honorably carrying on Roxie’s legacy thru therapy and working in hospice visits. Desi came to us as a rescue in 2015. She was 2.5 years old and had come from an abusive situation in a junk yard from down south. Roxie was 6 years old at the time. After working out some issues with Desi, I could see despite both being females, they were sisters, a team. So as a team we started visiting hospice patients in Harrisburg PA. They did well and brought great joy and smiles to otherwise dismal situations. From there I started training them for therapy dogs. I found Kpets and immediately liked what they stood for so I went to an orientation and met Karen the owner. At the time a three team unit (two dogs/One handler) was not heard of. Karen did not turn me away and after much conversation and persistence we got approved as a three team unit on 4-11-16. As a team Roxie and Desi brought love, happiness and smiles to children, adults, and the elderly. When we lost our sweet Roxie we were devastated beyond words for Roxie and Desi both taught us that no matter what life throws at you, you just bite the bone and keep going. Although it has been tough Desi and I continue therapy and hospice visits to bring joy and happiness to all we can, knowing our beloved Roxie is with us. Desi is a special therapy dog. My wife and I adopted Rocky at age two. We immediately knew he had the personality to become a therapy dog. He has been working since 2012. 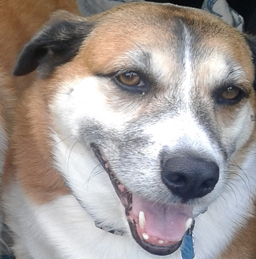 Rocky’s strong presence, kind nature, and willingness to please are all attributes that serve to make him a Hero Dog . Rock’s work with elderly nursing home patients, veterans, sick children, and incarcerated young adults is heartwarming and special. But now more than ever his visits to the oncology ward have taken on special meaning. Rock has recently been diagnosed with cancer and has begun his own chemo treatments. In spite of that he continues to visit the hospital and will continue to do so as long as his health remains good. Rock never hesitates to ease the burden of a cancer patient. Many are touched when they learn he too is afflicted with cancer. I believe he shows them there is hope and strength within them while providing a loving head to caress. He also is a favorite of the staff. Rock helps give them the strength to get through long tough days. He shows me every day what true caring and strength of character really are. He is more than just a dog……he is a furry angel sent to teach the world what it could and should be. 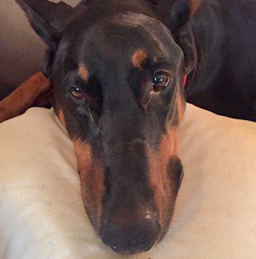 Rock’s photo shows the love in his eyes and the gentle nature in his heart. He is my hero! 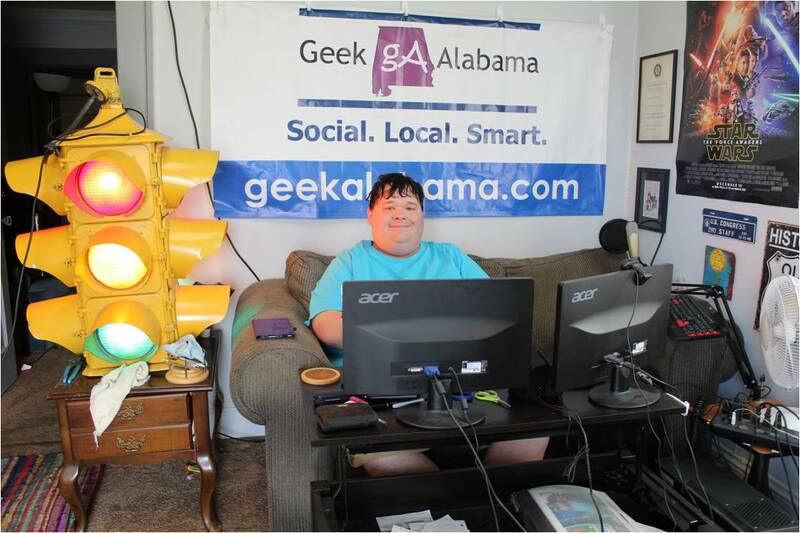 In addition, there are two dogs who live in Alabama who are in this contest! I adopted Tata while working in Dodge City, KS. We went to a local area shelter and looked for a fur baby to adopt. We could not find anything that ” spoke”to us. On the way out the door we heard a whimper and asked what it was. The lady said the dog’s name was Tasha. She had been found wandering around the railroad tracks at the railhead. She was extremely emaciated, in heat, and covered in fleas. She was taken to the vet and received care. She was still in bad shape but my wife said we could love her back to health. I protested and said what are we going to do. We adopted her after that. The next day after work I came home and sat down in the recliner and was talking with my wife and Tata heard my voice. She ran out of the bedroom ad finally made her way to me. She climbed up my legs and laid down in my lap and went to sleep. From that moment on I was hers. She traveled with me to Idaho, California, and back home to Alabama. I am a Desert Storm veteran diagnosed with PTSD. And in the amount of time I’ve had Tata, she has been my “therapy” dog. When I start to feel a panic attack or get very angry she paws at me or licks me in the face. If it hadn’t been for her I would be in a bad place right now. Sometimes I feel that she is my reason for living. I know you have heard a thousand times. What makes this one stand is Tata is blind. The vet actually said that it looks like she was born that way. My baby is special even if I am the only one that thinks that. K-9 Sheeva wasn’t born and bred as a law enforcement service dog as many other stereotypical dogs are. In fact, she grew up on the streets of Texas abandoned and alone. 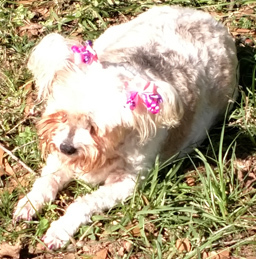 Miraculously, she was saved by a wonderful lady near the outskirts of San Antonio. Riddled with fleas, ticks, and starvation she began her slow road to rehabilitation. She eventually was fostered but soon taken back by her original savior due to neglectful living arrangements. Due to her breed as a pitbull mix, she was continuously overlooked by numerous families. After time, she found herself placed in a Houston area animal shelter unknowingly awaiting the outcome of her future. A beautiful partnership between Animal Farm Foundation and Universal K9 soon turned the tide of her future. Sheeva was accepted into their narcotic detection dog program. 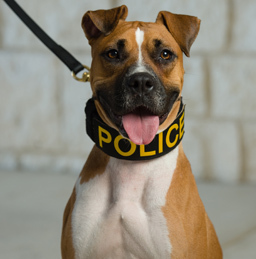 Sheeva completed her rigorous training and was placed with an officer in Alabama where she currently works and lives. With this action, Sheeva became the states first and only non-specific breed working K-9. Sheeva continues to grow in training as well as overcoming breed specific discrimination. Sheeva is the definition of an American hero dog. Living the American dream she began as nothing and has became something. That something is a courageous working dog with a purpose. Sheeva was photographed by Chris Smith of Ivey Photography.